Crochet bookmark patterns are perfect for so many reasons. They are small, so you can easily craft a lot of them in a short amount of time. Instant gratification projects like this are great stress relievers. You can also make a bunch of them to give away as last-minute gifts during the holiday season. However, just because the projects are small, doesn't mean that they have to be simple. There are many different crochet bookmark patterns. Yes, some of them are simple, which are great for meditative and easy projects. There are others, though, that give you the opportunity to practice more detailed, intricate stitchwork. Basically, if there's something you want to do in crochet, you can add it to a bookmark design. Heart Hook Home has designed a series of animal crochet bookmark patterns. This is, obviously, the bunny bookmark. 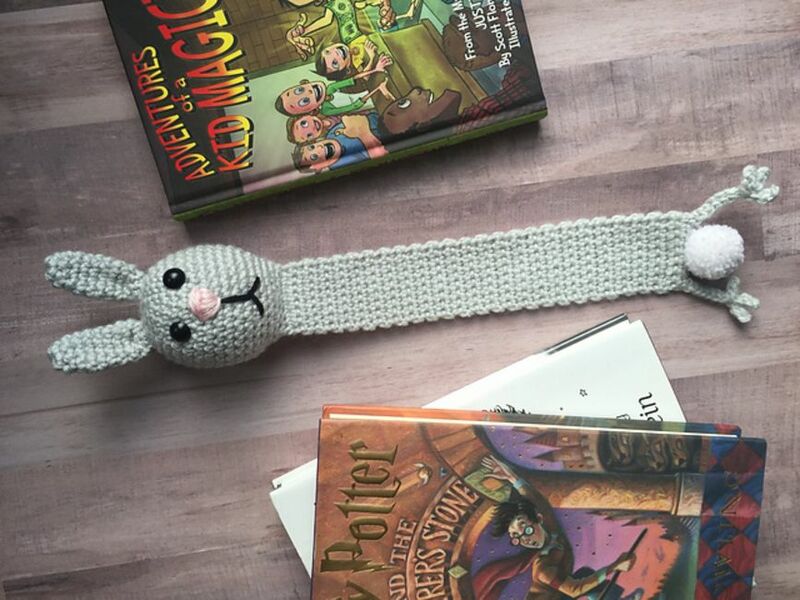 Each bookmark has a long body, with an amigurumi head that pokes out of the top of the book. The result is a cute design that brightens your bookshelves. Additional details, like the cottontail, peek out of the bottom of the book. There are many different approaches to designing a bookmark with an animal motif. This one is a simple crochet rectangle, with a cat applique added at the top. This is a bilingual crochet pattern available in both English and Dutch. Get five crochet bookmark patterns in one with this set. Learn how to make bookmarks inspired by some of your favorite literary characters: The Little Prince, Snow White, Harry Potter, Little Red Riding Hood, and Peter Pan. You can also learn how to make changes to the facial features and clothing/accessories. This will allow you to create characters with your own preferred style details. Bookmarks are, of course, associated with books. Books, in turn, are often associated with school ... and so are pencils. So why not crochet a pencil bookmark? This striped design can be worked in your school colors to show off some school spirit. You could also leave the tops off and have a simple rectangular bookmark instead of the pencil design. This happy little rainbow will give you joy as soon as you open your book. It's a simple striped crochet bookmark pattern topped off with a smiling little cloud. What a precious little design. Take a very small motif, make several versions of it, then stitch them together in a column to make a crochet bookmark. That is what Fiber Flux did here with this great floral crochet bookmark free pattern. It can be made in a single color or in all of the colors of the rainbow. This is a great stashbuster project! Even simple crochet circles can be stitched together to create truly eye-popping bookmarks. Make several in very bright colors to create joyful designs. Not everyone feels comfortable wearing bright pops of color, but almost everyone will relish a bright, bold bookmark. This design is similar to the motif-built crochet bookmarks. However, it's worked in one piece. There are several ways to create such a design. You could work it top down. Alternatively, you could crochet a chain for the vertical center of the bookmark and then work a round entirely around the chain to make the bookmark. Have fun discovering how this crochet bookmark is made. As you can see, a design doesn't have to be complex for it to work well as a bookmark. This simple rectangle is made using just single crochet and chain stitches. Choosing a beautiful variegated yarn will give this design that added extra touch. Chevron striping is one of the most iconic designs in fabric, and it is a popular choice in crochet. This free crochet bookmark pattern shows you the basics of a chevron stripe, with just one "v" shape. The color changes give you the perfect stripes. This is a pattern that you can work in almost any color combination. You could make the design again and again and never get bored with it. Plus it fits any book!